When the next episode of STAR TREK CONTINUES is revealed, science fiction fans will see a familiar face in a guest star role. The new episode, titled Still Treads the Shadow, features guest star Rekha Sharma, perhaps best known to science fiction fans for her role in more than 30 episodes of Battlestar Galactica. While details of Sharma's character in STAR TREK CONTINUES are being kept under wraps until April, she says the offer for a role came after meeting Vic "Kirk" Mignogna at FedCon Germany last year during the 50th Anniversary of STAR TREK event. “Vic and I kept in touch after FedCon, and then he asked if I’d be interested in coming aboard STAR TREK CONTINUES. He told me about a script that was in development and the character he had in mind. I’m so delighted that it worked with my schedule,” Sharma says. Sharma’s first introduction to the original STAR TREK series came from her big brother. “All my friends were watching Full House or something. I’m not sure! And there I was, coming home after school and watching the original STAR TREK and old Perry Mason reruns! I remember my brother told me that there were people opening and closing the doors, which I thought it was so cool and cheesy. And it very much appealed to my dreams of utopia -- especially as a young colored girl growing up in very white neighborhoods,” says Sharma. 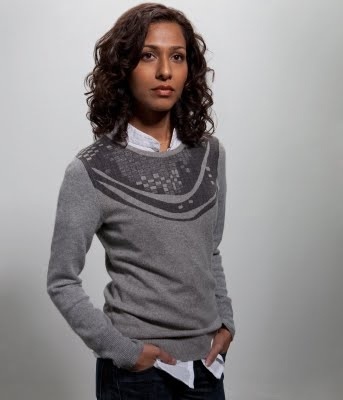 Rekha’s character of Tory Foster in the rebooted Battlestar Galactica, which began in 2004, developed after several auditions. “From the very first audition, I was immediately struck by the intelligence, artistry and kind-heartedness of the directors and producers. I thought, I’d really like to work with these people! First I went in for the role of a Viper pilot, then a captain, and then the role of Tory came along. Oh yeah, I thought, this is a perfect part for me.” Galactica’s producers apparently agreed. “Working on Battlestar Galactica was a dream come true. From my previous experience, I honestly didn’t think I could be creatively satisfied working in TV. But Battlestar Galactica changed that. Not only was it creatively satisfying, but we also had such a great team of people. We are all like family to this day,” Sharma explains. What does it mean to be a STAR TREK CONTINUES guest star? “It means I have fulfilled a dream, in a way, and that I’ve come full circle. I loved those stories. They had a wonderful morality and vision for humanity that made my heart sing. And then I got to step onto those sets and step into my childhood and be a part of telling that kind of story. Not only that, but that world was so fun! I loved those neat-o futuristic gadgets when I was a kid. And now, as an adult, I got to play with them. I got to sit on the bridge. There weren’t any trailers, so when I needed to rest between scenes, I took naps in sickbay on board the Enterprise. And I got beamed in the transporter! I can’t wait to see that,” she says enthusiastically. She admits to being very surprised at what the cast and crew have created with STAR TREK CONTINUES. “You know, Vic told me that I’d become part of the family, but I had no idea what he meant. They have chosen a team who are all friendly, diligent, thoughtful and good-hearted people. I felt so welcomed and incredibly lucky. It makes sense that they’re shooting in the south – they’re so hospitable! And those sets! Again, Vic told me what they built, but until you’re there you just can’t conceive of it. It’s really impressive. I know I’m not the only one who was moved to tears,” Sharma says. Fans will be able to see Rekha Sharma at future conventions and events. “Still Treads the Shadow” will premiere at Fan Expo Dallas on April 1 at the Dallas Convention Center. I'm elated that there will be more episodes but sad that the end is near. The word impressive would be an understatement as to how I feel about STC. Gratitude would be another. I just hope the storylines focus on the fun stuff - action and adventure aka space exploration and not rooted in obvious political correctness - racism, women's rights etc... We all need a break from the agendas, statements and politics. I'm so sad your five-year mission is coming to a close, but your fans appreciate your hard work so much!! I hope you will have set tours as part of your future plans, much like James Cawley is doing in NY. THANK YOU!! LOVE your show! Vic is the best successor to Kirk ever. Every episode is excellent and really made me happy. Thank you! The Greatest things about these fan productions from STC is they all stand up to the greatest of all official episodes, and maybe even better! Love this!!! Series is near. The cast, writers and rest of the crew did an outstanding job to carry on the spirit of TOS. Another fine addition to Star Trek Canon. "Studio Ghibli" You mean Porco Rosso right I thought so too remembering flying the plane with a young "girl friend"
Star Trek Continues Must Go On Forever ! Best Wishes From Italy ! Save The Real Star Trek From Extinction Hollywood Event ! In Memory of Anton Yelchin. I have to say, this episode got me a little teary. Well done, for telling stories that mean something.